In this issue of News and Reviews, we offer two reviews on films about Korea, and two on films about China. The Korean films, both reviewed by Hosu Kim, treat a topic that has been of growing interest and concern over the last few decades, that of foreign (especially U.S.) adoption of Korean children. At first glance, this subject may seem more a matter of Asian American interest, but as Professor Kim shows, these films also consider the impact that these adoptions have had on Korean women, families, and society, and have much to offer students learning about Korea. The two films on China, on the other hand, could hardly be more different from each other. "To the Light," reviewed by Shelley Chan, chronicles the lives of Chinese coal miners and their efforts to build better lives for their children, a story that probably resonates with the experience of U.S. Appalachian coal miners of only a few generations ago. The other film, "Down: Indie Rock in the PRC" reviewed by Maddie Wilcox, turns the documentary lens on the efforts of urban young people in China to express themselves in music in the context of a culture that does not easily tolerate this form of freedom of expression. Once again, I want to express my thanks to the reviewers who have generously contributed to this issue. If you are planning to attend the Association for Asian Studies annual conference in Philadelphia, please visit us at AAS Film Expo 2014: Expanding Asia, Connecting Culture, running March 27-29. The film schedule and links to more info can be found in this newsletter. All screenings are free and open to the public. We look forward to seeing you there. Directed by Deann Borshay Liem. 2010. 63 minutes. In English. In the Matter of Cha Jung Hee chronicles the unusual search for an adoptee's ghostly double. Deann Borshay Liem, whose Korean name is Kang Ok Jin, was adopted by the Borshay family in 1966 under the name of Cha Jung Hee. Before she left Korea to join her new family, the orphanage director told her not to reveal that she was actually Kang Ok Jin and not Cha Jung Hee. When Deann had learned enough English, however, she told her adoptive mother that she was not Cha Jung Hee and that she remembered her mother taking her to an orphanage. Her adoptive mother responded that her Korean mother had died while giving birth to her and that her father had been killed during the Korean War. Deann was a war orphan. And so, as Deann became increasingly immersed in her new life, new culture, and new family in America, her memory of Korea, her language, and her identity slowly evaporated. Then, one day, she discovered two different photographs, both of which were identified as Cha Jung Hee in the back. One photo was of her and the other was not. When she saw these two photos, she immediately knew that the other girl was Cha Jung Hee. She put this out of her mind until she found her birth family and received a letter from her older brother, Ho-Jin, who was still in Korea. He told her of long lost memories of her mother, five brothers and sisters, and herself as Kang Ok Jin, a girl of whom she had no memory. Distressed and shaken, Deann became obsessed with childhood images from home videos to capture the exact moment when she - Kang Ok Jin, later known as Cha Jung Hee - disappeared into Deann Borshay, the newly adopted daughter. She felt that if she were somehow been able to identify this moment, she perhaps could have retrieved her lost memories before they disappeared. Her longing for her identity did not cease, even after her discovery of her "real" identity as Kang Ok Jin. Rather, Deann could find "no proof that I was not who I was." In all of her adoption records, she was an orphan named Cha Jung Hee. Her driver's license and passport have Cha Jung Hee's birth date, not her own. This orphan identity carried her forward to the United States and continues to surface in her present life. To put this 'ghostly double' to rest, Deann decided to search for Cha Jung Hee. Directed by Tammy Chu. 2010. 75 minutes. English and Korean. 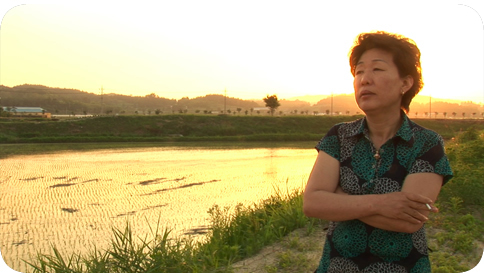 Resilience is a documentary film about the reunion and subsequent relationship between Brent Beesley, a Korean-born adoptee, and Noh Myung-Ja, his Korean mother. As an adopted child growing up in South Dakota, Brent had occasionally wondered, "What if I lived in South Korea with my biological family?" but never felt a particularly strong drive to search for his Korean family. It was not until much later, sparked by his daughter's congenital heart condition, that Brent began searching for the answers to the question: "Why was I adopted?" 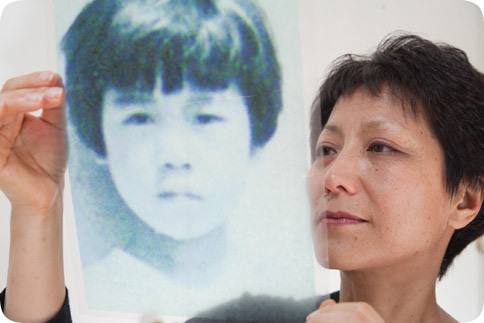 Brent searched for four or five years without yielding any results, but was then connected to Global Overseas Adoptees' Link, a Korean adoptee organization based in Seoul, Korea. This organization helped him to locate his birth mother, and a few months after finding her, Brent set off for Korea for the first time since he left as a child. His reunion with his birth mother was arranged by "Beautiful Pardon," a family search show produced by KBS, a major South Korean broadcasting company. It was through this televised reunion show that Brent learned of the circumstances surrounding his adoption and was able to meet his birth mother, Myung-Ja. After presenting Brent's adoption and reunion story, Resilience gingerly examines the obstacles, such as cultural differences, language barriers and geographical distance, and the rifts that arise as a result of adoption. A film by Yuanchen Liu. 2012. 69 minutes. In Chinese, with English subtitles. "There are four levels of existence: The best is a life completely satisfied; below that is a life not fully satisfied; third is death; and the worst, is a life of endless suffering." With this quote from "Quality of Life" in Lüshi chunqiu, a Chinese classic, the documentary opens with a black and white silent scene: several miners are moving a certain object from a cart and placing it onto the ground. This scene, reoccurring later in the documentary and the second time being in color with sound, sets a somber tone for the film. The audience discovers that it is actually a death scene from a coal mine in Sichuan province, China. The object being placed onto the ground is the body of one of the two miners who were killed in a mine accident on May 26th, 2010. 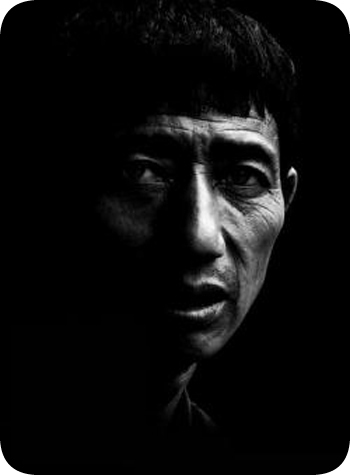 The documentary focuses on three families to illustrate the lives of Chinese coal miners. The audience sees all levels of existence in the above quote except level one, an unreachable level for people like miners in China. While the two repeating scenes represent level three, death, the most striking is what is said to be worse than death: endless suffering. In the meantime, the viewers also see how some miners' families are struggling with and trying to improve their unsatisfied lives. Written, produced and directed by Andrew Field and Jud Willmont. 2012. 52 minutes. In English and Chinese with English subtitles. In Down: Indie Rock in the PRC, Andrew Field and Jud Willmont explore Mainland China's vibrant underground rock music scene. The 52 minute documentary's lively pace, edgy subject matter, and insider perspective is refreshingly off the beaten path of most materials developed for students of China language and culture. As such, it can provide a bold counterpoint to more standard narratives of timeless cultural traditions. Filmed in 2007, Down opens with a succinct history of the introduction of rock music to China before it follows Field on a journey to, as he says, "find out how rock in China has changed since the early days of Cui Jian (the "godfather" of Chinese rock)..., to experience the rock music scene in the PRC (People's Republic of China) and to find out what that tells us about a changing China." This "indie rock doc" combines performances, behind the scenes footage at rock clubs and music festivals, and interviews with band members, promoters, and listeners to answer Field's questions about how and why the musicians make their art, how their music gets performed and distributed, and what its significance is to Chinese and world culture more broadly. Along the way, the music of up and coming bands like Hedgehog, PK-14, Carsick Cars, and Re-TROS are introduced as a new soundtrack to life in China today. AAS Film Expo was established as a conference program in 2011 by the Asian Educational Media Service (AEMS), to present documentary and independent films on issues reflecting contemporary life in Asia in a dedicated screening room with a schedule running from Thursday through Saturday. All screenings are free and open to the general public. For information about the films being screened this year, visit the AAS Film Expo website. A film by Stephen Maing. 2012. 87 minutes. In Mandarin with English subtitles. Introduction and discussion by Yimin Wang, Associate Director, Center for East Asian and Pacific Studies, UI. Introduction and post-screening discussion with Irv Drasnin, co-producer, writer, interviewer, and narrator of The Revolutionary.